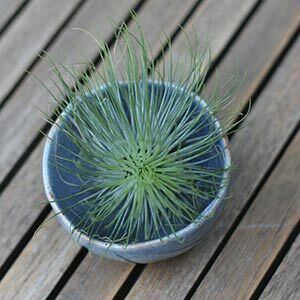 This fascinating species is Tillandsia andreana, not widely found, however you could not really call it rare. The species is endemic to Columbia, where it grows on rocky cliffs. However we found ours in a ceramics shop on the outskirts of Melbourne. 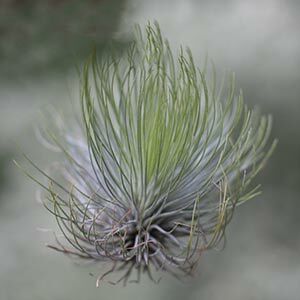 Like many, this is a Tillandsia with very fine foliage, soft to touch and a mid green in colour. You can grow them indoors or outdoors and ours is happy in its little ceramic pot. Ours has not yet flowered, however we are assured that this is red flowering species. We are also told not to be to concerned about the foliage changing colour to have a tinge of red, as this is actually a good sign, it means it os about flower. Best grown in in good filtered light or dappled shade, although a little morning sun seems to keep ours in condition. Like most air plants T. andreana does like a little spray misting, we spray ours once a week in winter and three times a week in summer. In warmer climates, or in very hot summers more frequent misting may be required. Grow them in a container like ours, in a terrarium, or even mounted on some cork, T. andreana is a fascinating little plant.